This is a huge step in the right direction to correct the misaligned utility incentive structures and the industry business models that currently block innovation, as described in more detail here. Rightly so, the concern is how the utilities will be able to get to 100% renewables by 2045 and the goal with this bill is to ensure that barriers that would prevent or slow progress are removed. In Hawaii in particular, Colton Ching of Hawaiian Electric, at the Grid Edge conference, explained that on many of their islands, they are going to need every solution in order to make it - both centralized and decentralized along with other grid edge technologies that will support a dynamic grid. The question is how to tackle disrupting the other energy and utility markets in the country that don't have a mandate like this and probably won't for quite a while. As a start, it helps to understand how the rest of North America's utility markets are organized and regulated. The rest of the country is covered, at the bulk power and transmission level, by reliability entities overseen by the North American Electric Reliability Corporation (NERC). 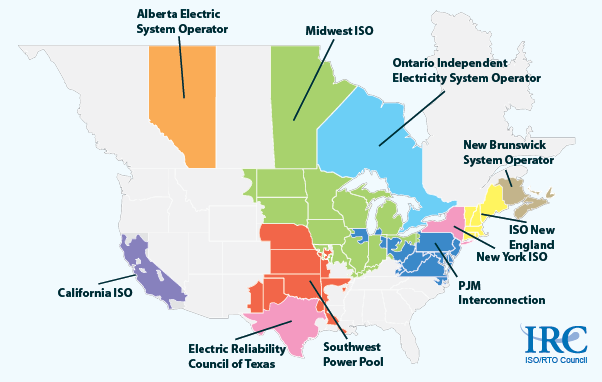 Eight regional reliability entities cover all of the interconnected power systems of the United States, Canada, and Mexico. Reliability regions in North America overseen by NERC. See Wikipedia for more detail. NERC is a non-profit and works with parties to develop joint standards for power system operation, assess resource adequacy, and conduct investigations into power system disturbances to improve reliability. Several of the NERC regions were formed early on as power pools, where power companies and electric utilities got together to pool power in order to ensure regional reliability and benefit from sharing each other's resources. The Southwest Power Pool (SPP) is a good example. The RTOs/ISOs described above operate wholesale electricity markets in their regions. Areas without an organized market are led by the utilities and power companies in their region conforming to NERC standards and requirements for reliability. In regions without an organized electricity market, many of the electric companies are still vertically integrated entities who own and control power generation, transmission, distribution, and retail operations. Selling and deploying innovative new products to North American utilities therefore requires a deep understanding of what market structure the utility is in and how the utility is incentivized. Putting together a strategy for which markets to tackle and when is the first step. Though important, California can be a tough market for energy startups. The decision making process is typically long and many contracts and engagements require prior regulatory approval, which can take years. One strategy for tackling California is to look outside the three major IOUs and secure early projects with the municipal utilities and water districts in the state. There can be more flexibility and willingness to try out alternative solutions there. Hawaii can be difficult as well. The Hawaiian utilities seem to be pretty large-scale focused, though this may be changing, as Colton indicated at the conference. The Hawaii Electric Companies received PUC approval last year (2017) for their Power Supply Improvement Plan (PSIP). The PSIP outlines how the utility plans to hit the state’s 100% renewables mandate by 2040, five years ahead of schedule. The main criticism the PUC had was that the utility needs to include more 3rd party players and focus on customers. this is good for vendors and will hopefully lead to opportunity for all of those with innovative solutions that can support a dynamic grid. FERC 841 requires RTOs and ISOs to put together plans for how energy storage will participate in markets. This is an encouraging step because it means that markets will need to accommodate storage and its capabilities eventually. Big questions remain around what these opportunities will look like, what it means for other DERs, and how the states might slow or impede progress.